We provide cleaning and restoration services to Hunterdon, Middlesex, Somerset and Mercer Counties. From professional carpet cleaning services to disaster restoration projects, our team of experts can help you make things right again. 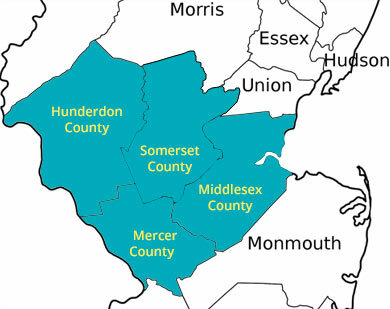 We serve townships and cities all throughout the following counties: Hunterdon, Middlesex, Somerset and Mercer. We’ve been serving the residents in central New Jersey for years and we intend to continue providing the best service and professional cleaning and restoration resources the area has to offer. Request a quote from us today by filling out the contact form below or give us a call at (866) 856-4007. We’re always happy to talk about your next special cleaning project or property disaster repair service.